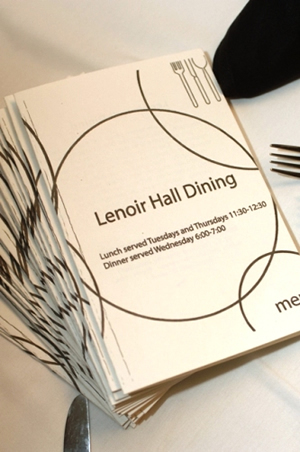 You are cordially invited to experience Lenoir Dining, a restaurant on The University of Mississippi campus run exclusively by Hospitality Management and Dietetics Students. We are glad that you have stopped by to visit, and we hope you will join us for some good food and friendly service! Lenoir Dining is an educational operation within the Department of Nutrition and Hospitality Management. Housed in Lenoir Hall, this non-profit 40-seat teaching laboratory offers students hands-on experiences in all facets of restaurant operations. Throughout the semester each student will rotate through various positions within the operation; ranging across service, cooking, and management functions. The evaluation cards available on each table allow you to provide helpful feedback to help them improve and their skills and increase their knowledge of the food service industry.